THE ADVENTURES OF YOUNG MAGIC MIKE! Songs: "The Bat", "The Ballad Of Young Magic Mike", "The Noise Monster Bop", "Gabriole The Giggling Pig", "Family Day At The Mall", "Just Say No", "Pikcher Land", PLUS "Magic Mike's Castle TV-Theme", "Magic Mike And Company TV-Theme", "The New Magic Mike's Castle Webcast Theme". It's a series of BOOKS! It's a COMIC-STRIP! It's a series of ANIMATED SHORTS! It's a CD! It's THE ADVENTURES OF YOUNG MAGIC MIKE'S CASTLE! Magic Mike Likey's prequel to his original 1980's/'90's television show. 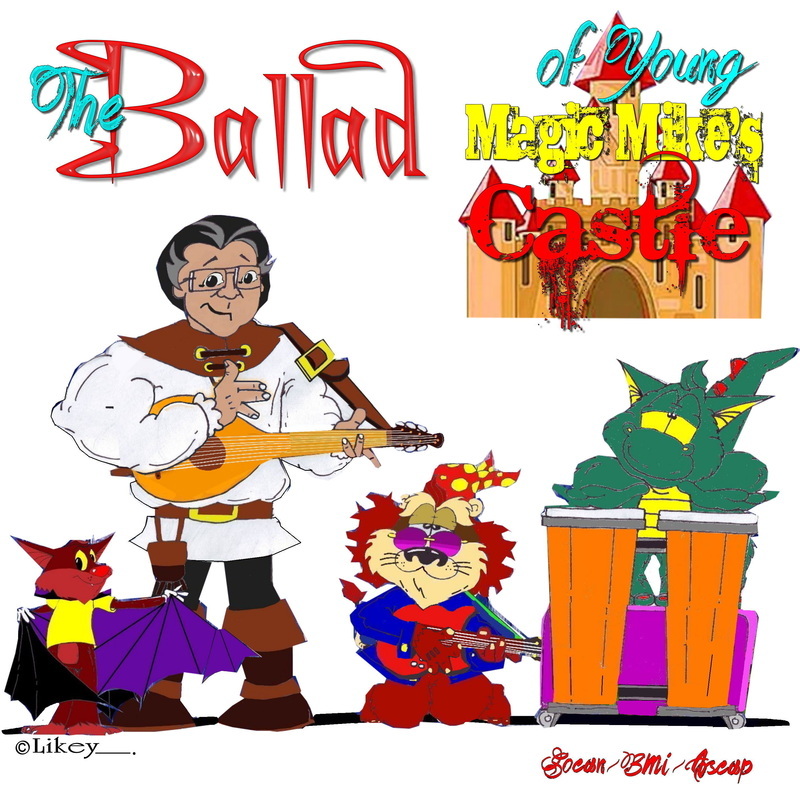 The location: young Magic Mike's parents' castle, where Mike, a magic enthusiast, artist, and musician, fantasizes numerous adventures both terrestrial and not, with his constant companions, "Desmond Dragon" and "Forgetful Lion", in reality, two stuffed toys, but who miraculously come to life and join Mike on his adventures! In the end, Mike's parents interrupt his daydream adventures by coming home, entering his room, or calling him for dinner. Mike never loses his sense of wonder, sense-of-humor, nor his passion and imagination. The story-books are in comic-book format, and often satirize society, politics, and life in general. Sometimes there are even life lessons, messages, and above all, love and humanity between the whimsical and humorous writings. 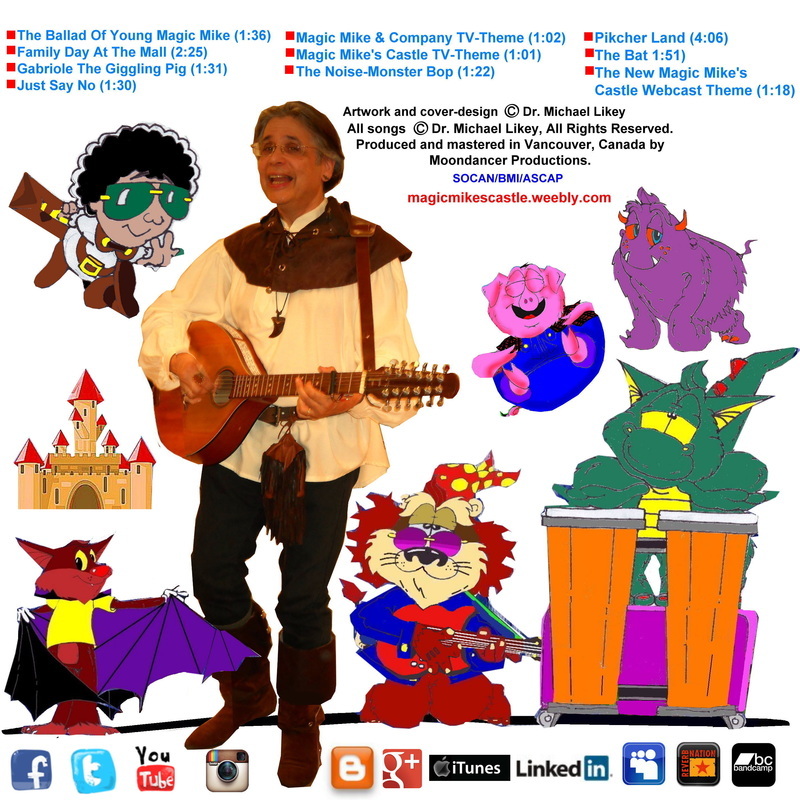 The author/animator is Dr. Michael Likey, who brought his original vision of his television-show to life in the 1980's and '90's, producing, hosting, writing, creating the sets and props, and performing the songs and magic-tricks culled from his magic-shop, "Merry Minstrel Majick". Together with puppeteer Darrell Scarrett, (the voice-talent and creator of the original Desmond and Forgetful) the original "Magic Mike's Castle" (in reruns and web-clips) still bring joy and nostalgia to the long-watching audiences of all ages! Today, Mike's web-series "The New Magic Mike's Castle" captures the charm of that original series! We are proud to welcome "Adventures of Young Magic Mike's Castle" to the "Magic Mike Likey Universe". Find Young Magic Mike On Facebook!